This Irish tea is Dublin Morning tea that is blended in Ireland by Bewley's. Dublin Morning Tea is a full-bodied tea that has a golden, deep orange color when brewed. This invigorating blend is of the finest Rwandan, Assam Indian and West of the Rift Kenyan teas. Bewley's Dublin Morning Tea is a traditional morning blend with a strong and refreshing flavor which is sure to ease you into your day as only an Irish cup of tea can. 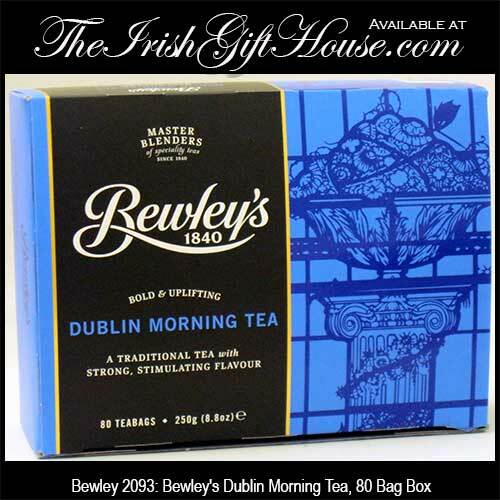 This box of Bewley's Dublin Morning Tea features 80 tea bags with a weight of 8.8 ounce (250g). Bewley's tea is a product of Ireland.